LOS ANGELES (AP) — They still fight like cats and dogs in divorce court. But more and more they are fighting about cats and dogs. Custody cases involving pets are on the rise across the country. In a 2006 survey by the 1,600-member American Academy of Matrimonial Lawyers, a quarter of respondents said pet custody cases had increased noticeably since 2001. The academy is due for another survey, but there is no doubt such cases have grown steadily since then, said Ken Altshuler of Portland, Maine, a divorce attorney and AAML president. If there is a child involved in a divorce, many judges will keep the pet with the child, attorneys said. "But what do you do when the pet is the child?" Altshuler asked. He is his own best example. He shares custody of 8-year-old Dudley, a longhaired standard black-and-tan dachshund, with his ex, who has remarried and introduced a step-dog to Dudley. 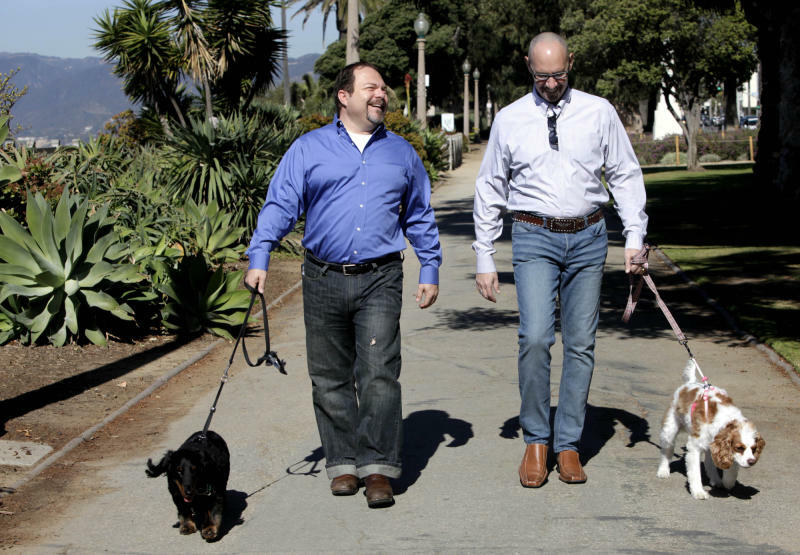 Pisarra and May became good friends and often take their dogs for walks in Santa Monica. They also teamed up last year to write a book about co-parenting a pet with an ex titled "What About Wally?" Pets are considered property in every state in the country. For years, they have been divvied up like furniture during divorce proceedings. But times are changing. "Judges are viewing them more akin to children than dining room sets. They are recognizing that people have an emotional attachment to their animals," Altshuler said. "There is a shifting consciousness," Pisarra said. "Pets are being given greater consideration under the law." "People are not embarrassed to fight for custody of a pet today. In the past they might have shied away from it because society didn't really accept a pet as anything other than an accessory to your life," she said. 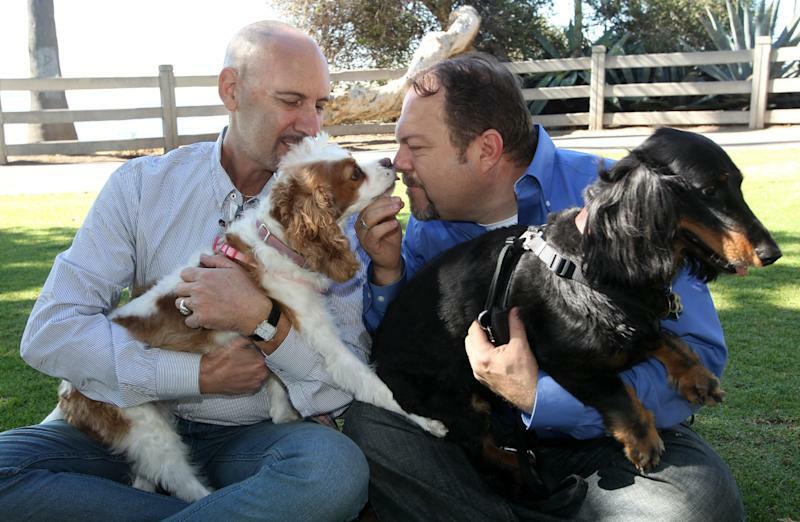 "There is no law that recognizes visitation with an animal," Raso said, so couples have to work it out themselves. After their 2006 breakup, Pisarra and Redd worked out shared custody, long-distance visitation and a new family (including a beagle) in Dudley's life, Pisarra said. Today, they live in the same city, so visitation no longer includes flight time. May and his wife Nina (who also wrote an introduction for the book) separated six years ago after 16 years of marriage. "Everything was fresh and raw. It was not easy." It's taken time, but he and his ex live about two miles apart in West Los Angeles now and sharing custody of their daughter and pets is easy, he said. To make it work, "you learn the true meaning of concession," May said. The three dogs the couple had then have died, but Winnie, his 3-year-old Cavalier King Charles spaniel, is very much like a family pet, said May, a consultant to veterinary and other pet-related companies. Pisarra represented a man whose estranged wife had the family's two German shepherds euthanized. "They were his running dogs. It was really cruel and he had no recourse," he said.